WASHINGTON — One of the biggest questions facing the future of US Navy carrier-based aviation is what will be the primary mission of its new unmanned jet. 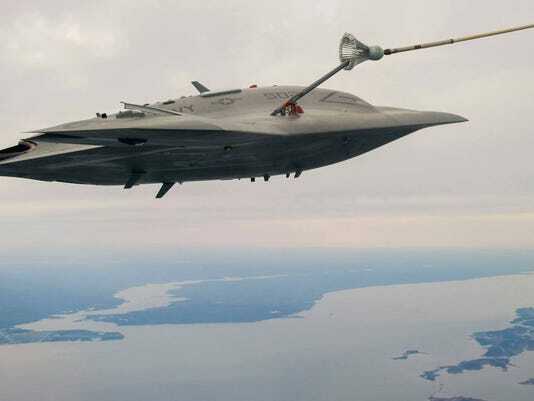 Some believe the aircraft – to be produced by the Unmanned Carrier-Launched Airborne Surveillance and Strike (UCLASS) program – should be a stealthy strike jet able to penetrate an enemy’s defenses without risking a pilot. Others want a spy plane, able to launch from a carrier and produce high-quality, real-time intelligence. The Navy was set to announce a choice in late summer 2014, but continuing controversy inside the service, the Pentagon and Capitol Hill led leadership to suspend any decision pending a service-wide review of unmanned and intelligence assets. Now it would seem a decision has been made between strike and recon. The winner? Enter the Carrier-Based Aerial-Refueling System, or CBARS. Very few details are known about CBARS – some sources were familiar with the effort but not the acronym. But it seems a significant portion of the UCLASS effort will now be directed to produce a carrier-based aerial tanker, able to refuel other planes low on gas. Defense Secretary Ash Carter could reveal the decision Tuesday morning when he’s to speak about the fiscal 2017 budget submission at the Economic Club in Washington. The budget itself is scheduled to be delivered to Congress on Feb. 9. Strike capabilities, the sources all said, would be put off to a future version of the aircraft. If so, the choice of a tanking role for UCLASS would be at odds with Congress, where enthusiasm for a strike aircraft has been strong. House and Senate advocates differed with the administration’s 2016 UCLASS request and with each other and, in the end, a compromise provision in the 2016 defense authorization act provided $350 million for the program, well over the Pentagon’s $135 million request. Congress made no mention of a need for an unmanned aerial tanking capability. Since fall 2014, the Pentagon has been undertaking a comprehensive, service-wide review of its unmanned intelligence, surveillance and reconnaissance capabilities. It is not yet clear how much of the ISR review will be made public. UCLASS supercedes the Unmanned Combat Air System-Demonstration (UCAS-D) program which produced the Northrop Grumman X-47B demonstrator aircraft. The Navy’s two X-47Bs conducted a series of sea-based trials in 2013 and 2014, proving the ability to launch and recover aboard an aircraft carrier at sea. Further trials in 2015 proved the aircraft could conduct aerial refueling – but as a receiving plane, not as a tanker. Northrop and Boeing were the prime contenders for UCLASS. It is not clear how the competing designs can be adapted to the tanking role. Aerial refueling is largely a byproduct of the jet age, where hungry engines ate fuel at much higher rates than propeller-driven aircraft. Refueling also gives combat planes the ability to carry out missions at far longer ranges, across oceans and continents, and it is not unusual for carrier-based strike aircraft to refuel several times in the course of a single combat mission. A number of carrier aircraft were adapted to handle the tanking role, including the A-3 Skywarrior, A-6 Intruder and S-3 Viking. F/A-18 Strike Hornets also carry out the role, fitted with refueling pods for individual missions but able to be quickly reconfigured for strike roles. Should the UCLASS be developed as a tanker, it could mark a first for naval aviation – the first time an aircraft was introduced as a tanker. It would also be unusual to develop such a sophisticated aircraft for the tanking mission, where generally less-complex aircraft are sufficient.